Hitachi L100 and SJ100 Frequency Inverters can now be purchased online using our new wizard to guide you through selecting and purchasing the right Inverter to suit any application. Simply enter the secure catalogue environment and answer three simple questions, the suitable inverter will then be displayed along with the filter and software to suit. Click on the items you would like to add to the shopping basket and when you are happy with the items in the basket proceed to the checkout. 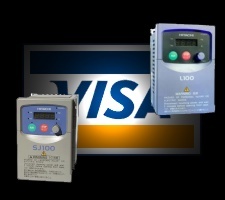 We can accept either VISA, DELTA, MASTERCARD, JCB, SWITCH, SOLO or if you are an existing customer simply input your account number and order number. This Service is currently unavailable - Please contact us on 01942 260206.